Andrew Eskew, of Mrrion [sic], visited his sister, Mrs. Mattie Coleman, last Sunday. Source: Crittenden Record-Press. (Marion, Ky.) 1907-1909, February 27, 1908, Image 10 - Chronicling America - The Library of Congress. Source: Crittenden Record-Press. (Marion, Ky.) 1907-1909, April 9, 1908, Image 3 - Chronicling America - The Library of Congress. Source: Crittenden Record-Press. (Marion, Ky.) 1907-1909, February 25, 1909, Image 6 - Chronicling America - The Library of Congress. 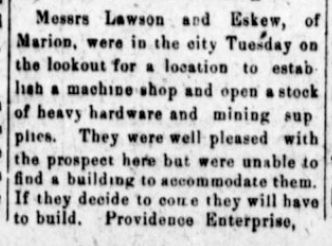 Messrs Lawson and Eskew, of Marion, were in the city Tuesday on the lookout for a location to establish a machine shop and open a stock of heavy hardware and mining supplies. They were well pleased with the prospect here but were unable to find a building to accommodate them. If they decide to come they will have to build. Providence Enterprise. Source: Crittenden Record-Press. (Marion, Ky.) 1907-1909, March 25, 1909, Image 5 - Chronicling America - The Library of Congress. 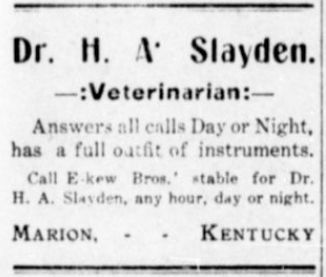 Call Eskew Bros.' stable for Dr. H. A. Slayden, any hour, day or night. Source: Crittenden Record-Press. (Marion, Ky.) 1907-1909, April 22, 1909, Image 5 - Chronicling America - The Library of Congress. Source: Crittenden Record-Press. (Marion, Ky.) 1907-1909, May 20, 1909, Image 7 - Chronicling America - The Library of Congress. Source: Crittenden Record-Press. (Marion, Ky.) 1907-1909, June 10, 1909, Image 1 - Chronicling America - The Library of Congress. A horse belonging to Eskew Bros., died of lockjaw Monday from the effect of having a nail in his foot. Source: Crittenden Record-Press. (Marion, Ky.) 1907-1909, June 17, 1909, Image 5 - Chronicling America - The Library of Congress. Source: Twice-A-Week Record-Press. (Marion, Ky.) 1909-1909, August 10, 1909, Image 4 - Chronicling America - The Library of Congress. DEATH, THE GRIM REAPER'S RICH HARVEST. Number of Prominent Citizens Have Been Called to Their Reward The Past Week. 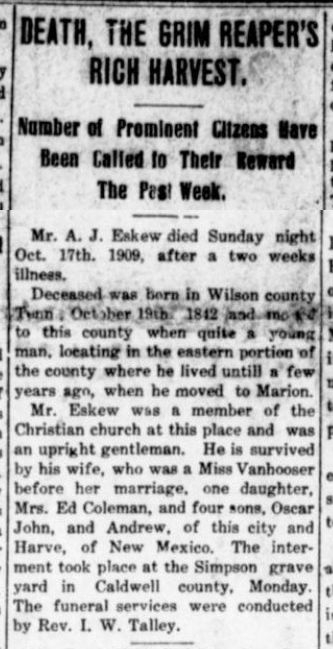 Mr. A. J. Eskew died Sunday night Oct. 17th, 1909, after a two weeks illness. Deceased was born in Wilson county, Tenn. October 19th, 1842 and moved to this county when quite a young man, locating in the eastern portion of the county where he lived until a few years ago, when he moved to Marion. Mr. Eskew was a member of the Christian church at this place and was an upright gentleman. 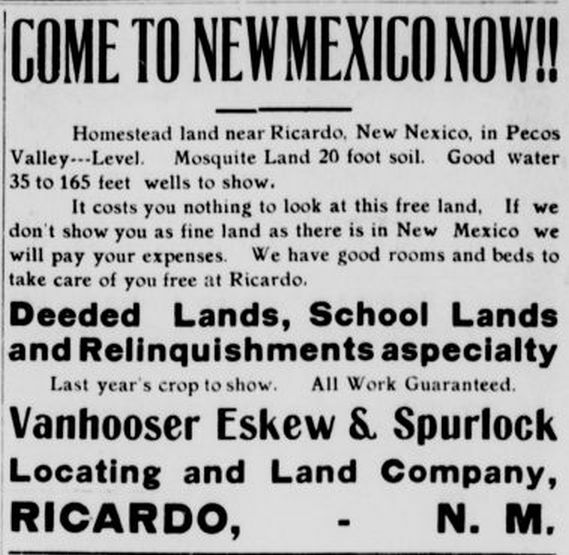 He is survived by his wife, who was a Miss Vanhooser before her marriage, one daughter, Mrs. Ed Coleman, and four sons, Oscar, John, and Andrew, of this city and Harve, of New Mexico. The interment took place at the Simpson graveyard in Caldwell county, Monday. The funeral services were conducted by Rev. I. W. Talley. Source: Crittenden Record-Press. (Marion, Ky.) 1909-1918, October 21, 1909, Image 1 - Chronicling America - The Library of Congress. 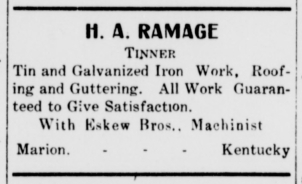 For any kind of tin work, see H. A. Ramage with Eskew Bros. If you need any guttering done, see H. A. Ramage with Eskew Bros. Source: Crittenden Record-Press. (Marion, Ky.) 1909-1918, February 3, 1910, Edition 2, Image 5 - Chronicling America - The Library of Congress. Source: Crittenden Record-Press. (Marion, Ky.) 1909-1918, March 3, 1910, Edition 2, Image 3 - Chronicling America - The Library of Congress. 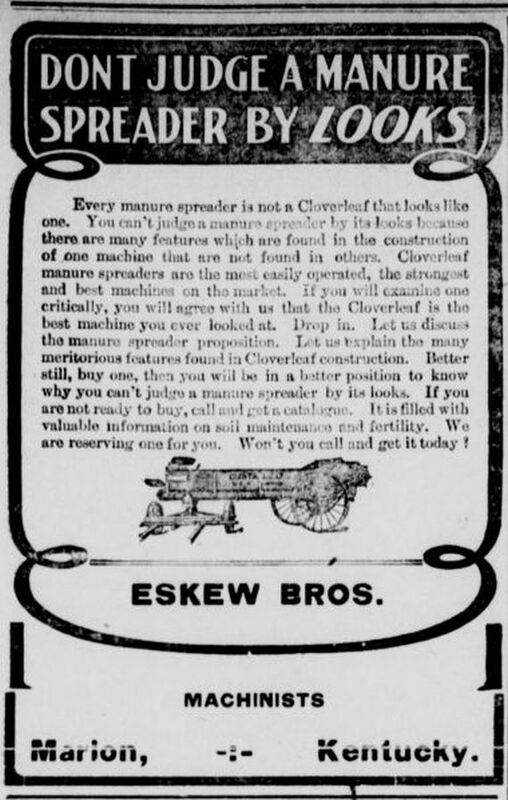 Eskew Bros. set up two new buggies Monday for their livery trade. Source: Crittenden Record-Press. (Marion, Ky.) 1909-1918, May 5, 1910, Edition 2, Image 5 - Chronicling America - The Library of Congress. 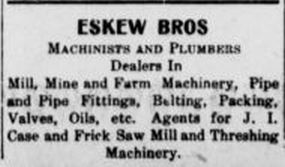 J. C. Eskew went to Louisville Tuesday in the interest of the Shrodes valve the firm of Eskew Bros., are promoting. 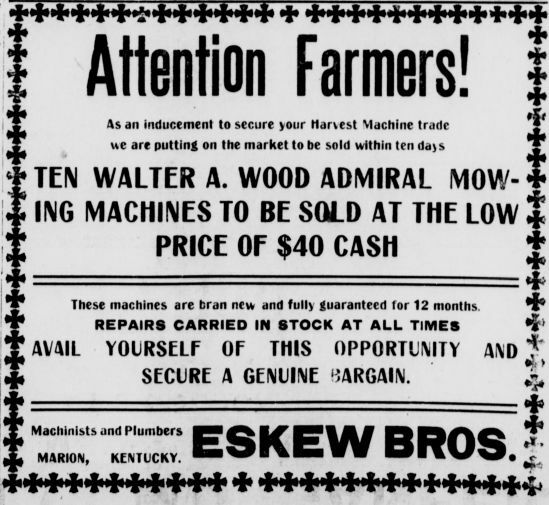 Source: Crittenden Record-Press. (Marion, Ky.) 1909-1918, May 12, 1910, Edition 2, Image 5 - Chronicling America - The Library of Congress. Source: Crittenden Record-Press. (Marion, Ky.) 1909-1918, June 16, 1910, Edition 2, Image 8 - Chronicling America - The Library of Congress. 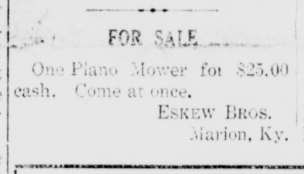 One Piano Mower for $25.00 cash. Come at once. Source: Crittenden Record-Press. (Marion, Ky.) 1909-1918, June 23, 1910, Edition 2, Image 1 - Chronicling America - The Library of Congress. 4 $25.00 3 wheel Sweep Rakes at $22.50 each, cash, brand new and fully guaranteed. Come quick. 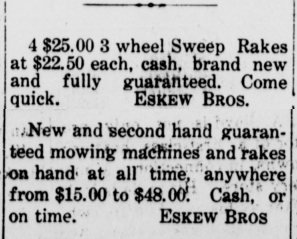 ESKEW BROS.
New and second hand guaranteed mowing machines and rakes on hand at all time, anywhere from $15.00 to $48.00. Cash, or on time. 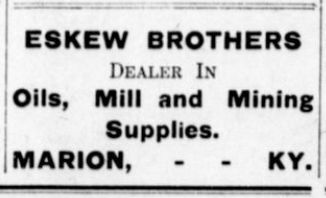 ESKEW BROS. Source: Crittenden Record-Press. (Marion, Ky.) 1909-1918, June 30, 1910, Edition 2, Image 4 - Chronicling America - The Library of Congress. Go to Eskew Bro. for your wheat fertilizer. 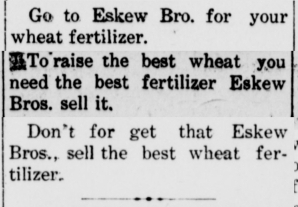 To raise the best wheat you need the best fertilizer Eskew Bros. sell it. Don't for get that Eskew Bros., sell the best wheat fertilizer. Source: Crittenden Record-Press. (Marion, Ky.) 1909-1918, September 22, 1910, Edition 2, Image 4 - Chronicling America - The Library of Congress. 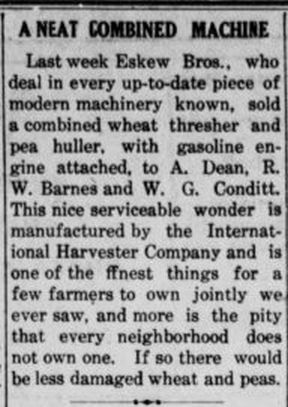 Last week Eskew Bros., who deal in every up-to-date piece of modern machinery known, sold a combined wheat thresher and pea huller, with gasoline engine attached, to A. Dean, R. W. Barnes and W. G. Conditt. This nice serviceable wonder is manufactured by the International Harvester Company and is one of the ffnest [sic] things for a few farmers to own jointly we ever saw, and more is the pity that every neighborhood does not own one. If so there would be less damaged wheat and peas. Source: Crittenden Record-Press. (Marion, Ky.) 1909-1918, September 29, 1910, Edition 2, Image 6 - Chronicling America - The Library of Congress. The many friends of Oscar Eskew were surprised this week when the news was flashed over town that he had sold his interest in the large livery barn of Eskew & Hicklin, to his genial, clever rival, Geo. Foster who already owns the barn on Main street. These two stables have, since these gentlemen owned them, been recognized as the two leading livery barns in this end of the state, and while the people are loth [sic] to give up so clever and courteous a gentleman as Mr. Eskew, there is not one spark of regret that Mr. Foster is to be his successor. In losing Mr. Eskew we feel to have lost a man who has tried as faithfully as any man could to please and serve the public. But just as sure are they that Mr. Foster will equally care for them. Mr. Hicklin will care for the Salem street stable, while Mr. Foster will rule at the one on Main street. Source: Crittenden Record-Press. (Marion, Ky.) 1909-1918, November 3, 1910, Edition 2, Image 1 - Chronicling America - The Library of Congress. 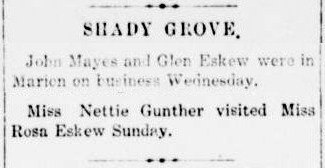 Mrs. C. M. Abner left Thursday for Stonnington, Colo., to join her husband after a visit of several weeks to her mother, Mrs. Oscar Eskew. 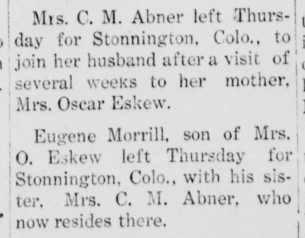 Eugene Morrill, son of Mrs. O. Eskew left Thursday for Stonnington, Colo., with his sister, Mrs. C. M. Abner, who now resides there. Source: Crittenden Record-Press. (Marion, Ky.) 1909-1918, November 3, 1910, Edition 2, Image 13 - Chronicling America - The Library of Congress. John Eskew was in Princeton on business Monday. Source: Crittenden Record-Press. (Marion, Ky.) 1909-1918, December 1, 1910, Edition 2, Image 5 - Chronicling America - The Library of Congress. Source: Crittenden Record-Press. (Marion, Ky.) 1909-1918, December 15, 1910, Edition 2, Image 3 - Chronicling America - The Library of Congress. John Mayes and Glen Eskew were in Marion on business Wednesday. Miss Nettie Gunther visited Miss Rosa Eskew Sunday. Source: Crittenden Record-Press. (Marion, Ky.) 1909-1918, December 22, 1910, Edition 2, Image 8 - Chronicling America - The Library of Congress.